I’ve started to up the number of start-up/tech events I am attending around the city. I’ve really been enjoying these, seeing new ideas and getting a better feel for where the scene is and where it is heading. As it’s a new month, I figured I would start a running total of what events I am attending. This will mainly be an exercise, first, to allow me to keep track of where am I going, and second, to force myself to write more. Hopefully this will also help give insight into the type of events that are available around the city, and to expect from them. Of course, please let me know if you hear of any good events that I should be checking out. So without further ado…. My first Dumbo Tech Breakfast, and it was great. I don’t yet consider myself a programmer, but I really enjoy talking with the group, hearing new ideas and problems, and after warming up a bit, being able to provide my input and thoughts. Had a lot of fun and will definitely be back. It is now 3:30 AM on a Friday night and I am sitting in front of my computer, exactly where I have been since 5:30 PM yesterday. I’m tired and I am going home and to bed but I have to vent real quick. I have been teaching myself Ruby on Rails for while now, and I guess what surprises me the most is how much I don’t mind sitting in front of my computer for ten hours trying to figure out how to make something work. For continued practice I am building a little personal web app. Part of what I want this app to do is to scrape some info, present it to me, and then allow me to add it to my Google Calendar. Simple enough. I check through Railscast to learn about the Gems for scraping. I run into a few problems, use google, figure it, keep going. Another problem, Google, Stack Overflow, Google more, figure out, keep going. Doing well then, BAM, a roadblock. Google, nothing. Stack Overflow, nothing. Page 32 of Google results, nothing. Hmmm. Dig into my code, can’t find anything out of place. Maybe it is just late and I have tired eyes? Well it was only like 10:30 at this point so I don’t think it’s that. Another hour of scratching my head, and I figure it out. Websites can do things to stop others from simple scraping. HA, nice. I mentally figure out a work around, and then start thinking. Do I even really need the scraping? Everything I’ve ever read or heard people say about building apps includes: start simple, get it working, then add functionality. Forgetting that I just spent six hours figuring out a problem I now see as useless I, excuse the pun, scrape the original idea and move to get started on the simpler version. So now it’s four hours later I’ve run into another roadblock. Three hours of trying and I still can’t get Google’s API connected to my app. Back to the previous exercise. Is it necessary to be connected to my Google Account? No. Should I have thought about this before I started working on it? Yes. AAAAHHHHHHH. The point of this vent is two-fold. First, a thorough plan is needed before starting any project, no matter how big or small. And that plan should follow the path of: very simplest version first, then add functionality as you iterate from there. Second, and the craziest part for me, I thoroughly enjoyed tonight. Ten hours of staring at computer, struggling to solve problems… I must be crazy. No, I just spent ten hours building something, learning a ton, and solving problems, and that makes it a good night. For everybody taking the time to learn how to program, I hope you remember to enjoy the whole experience. I may never be the best programmer, but I am enjoying trying. Lyndsey recently got a new job at a new-to-the-US apparel production company. It is a pretty awesome gig for her, she’s basically running the US arm of a Turkish company. It has been fun for me too, because I get to give my two cents on various aspects of the business they are building. Using my new knowledge of Ruby on Rails I have been working on a web app to keep on eye the production chain for them, its a fun little project and I am getting to learn about a ton of new gems. Lyndsey asked me if I would take a break from the fun I was having with Rails to put together a simple website/blog for them. I obliged and this is what I came up. Nothing special, but I did get to pick up some new knowledge on CSS3, cross browser functionality, and log some time in Photoshop. Take a look. Free idea for iOS/Android Developers!!! GroupMe is great. I use with my Brooklyn San Francisco 49ers crew to figure out who is going where to watch the games. I also successfully got my whole family to join. One text and my mom can’t complain that I’m not talking to my sisters. A while ago I thought of a similar tool that I think could be pretty useful. Maybe not as wide-spread, but I think the niche would pay for it. Here’s the background. I was at a friend’s apartment for dinner and drinks. One of girls at the dinner was a late addition because some dude she was seeing decided to take a trip out of the city and didn’t invite her. She was a bit peeved at this so she was spending the night texting back and forth with him, trying to figure out why she wasn’t invited. This of course meant that with every new text she received she announced it to the room and then all the girls present would huddle and decide as a group how she should respond. This went on the whole night. So here’s is the idea. This will mainly be targeted to groups of female friends, but I others could use it too, I’ll call it ReplyHelp. I explain it through example. Kristina downloads ReplyHelp pulls up her crush James from her address book. After selecting James, she proceeds to select her closest friends to help her reply to James’ text messages. Now every time James texts Kristina, James’ text will automatically be forwarded to the friends Kristina selected. The group of friends are now able to chat in real time with each other to collectively decide how Kristina should respond. Once it is decided, Kristina sends response from directly from the app and James is none the wiser. Once he responds it starts all over. That is the basic idea. Some aspects that should be included: Kristina should be able to turn off and on the automatic forwarding of messages, but if it is turned off, she can select a message to receive help from. Similar to GroupMe the group will basically have their own number so that those without the app can still participate as part of the group. Kristina can have different groups for her different crushes. Thoughts? Anyone want to partner up and build it? Meanwhile, heat the oil in a large saucepan over medium heat. Add the sausage and cook, breaking it up with a spoon, until it’s no longer pink, 5 to 6 minutes. Stir in the garlic and cook 1 minute. Add the broth and red pepper and bring to a boil. Add the broccoli rabe and simmer, covered, until tender, 3 to 4 minutes. Stir in the butter and Parmesan and cook, uncovered, until the sauce thickens slightly, 1 to 2 minutes. Toss the pasta with the sausage mixture and ¼ teaspoon each salt and pepper. Over the years I’ve gained a pretty decent handle on html and css. I’m not going to win any programming races, but I can put a website together. For Armbrusting.com, I’ve used this limited knowledge to create a child theme for Thematic. I’ll be updated this site as I learn more about WordPress, but its working now so I’m happy. Plus, I would like to move on to bigger and better things, which now means learning Ruby on Rails. I’m sure I’ll be talking about how it goes. Bacon French Toast! Well, maybe not specifically bacon, but pancetta. On Saturdays the local butcher/deli, Lorimer Market, sells fresh loaves of Pancetta Bread (supposedly baked once a week by the butcher’s mother). This bread is absolutely delicious. Almost immediately after tasting it for the first time I knew I wanted to turn it into french toast. This was my second time making it and, like the first, it turned out excellent. I followed Alton Brown’s french toast recipe. I’ll have to write about my thoughts on Alton Brown soon, but for now I’ll just say he is one of the first places I go to look for recipes. I can always trust a simple, effective, and scientific based recipe. The scientific part is what always gets me, so much chemistry goes in to cooking after all. The first thing you will notice is that the recipe calls for day old or stale bread, well the pancetta bread comes fresh from the oven so that is a problem. To compensate I threw my inch and half thick slices in the oven for a bit to dry out, but not long enough to toast. To me the key to Alton’s recipe is that fact you are only browning each side, and the final cooking goes on in oven. This means you can use really thick slices of bread and get a solid custarding throughout the whole slice. To top the french toast I heated pure maple syrup with banana slices. The syrup turned banana-y and the slices turned almost candied. I had never done this with bananas before, so I was happy it turned out well. I also topped with additional fresh banana slices. In the end everything comes together. The pancetta’s flavor and saltiness comes through just enough over the custard of the toast and the sweetness of the syrup. I like the bananas; they give an additional layer that is needed to compliment the pancetta. Watch out though, you do immediately want to lay down and sleep the rest of the day. Next time: I made this for brunch with my girlfriend. As we were eating I commented on how it needed a creamy aspect, I suggested whipped cream. She retorted with ice cream. I’m a little mad I didn’t think of that. I’ve even had ice cream on french toast at Little Giant. So next time, it will be made with ice cream on top, and I thinking I will leave off the fresh bananas and instead add more slices to the syrup. Side notes: This bread would also be delicious to make peanut butter and banana sandwiches on. Other ideas? February 26th was one of the first truly beautiful spring days of 2011. I was making my way around the city running errands when my morning coffee wore off. I realized I hadn’t eaten all day and was starving. I had recently been talking about the article Grub Street posted last year listing the 101 Best Sandwiches in New York, so I figured this was a great time to pull out that list try one. After that lunch, I decided that it wouldn’t be a bad idea to see how many of these 101 sandwiches I could try. I’ll keep the running list here. 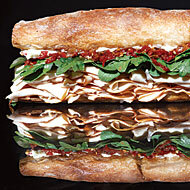 Part of my Series on Grub Street’s 101 Best Sandwiches in New York. Beautiful spring afternoon, hungry, and roaming around the East Village… sounds like the perfect time for a pork sandwich. Running into Porchetta on Saturday afternoon can be tricky; the place is often busy. When we arrived there was no line and two open stools, when we left it was full and there was a line out the door. The girl at the counter was helpful, telling us newbies normally order the sandwich and the plate. We were newbies, so we ordered that. I also ordered some kimchi off of the specials menu, a little odd at an Italian joint, but whatever, I dig spicy vinegar. The sandwich was decent, but it doesn’t deserve #10 in the city. It’s just a bunch of pork on a baguette. The baguette was tasty, but it had a real crunchy crust, so you have to be alright with that. The actual pork meat was delicious, unbelievably flavorful, tender, and juicy. Then there were the fatty parts, rendered out into deliciously juicy bits of porky goodness. The bites where you had the juice softening the bread with pieces of meat and fat were the absolute best. The sandwich was also topped cracklins. The cracklings were good by themselves, but I would rather not have them on my sandwich. It is a little much to have to tear through a thick baguette only to bite directly down a hard cracking. I ended up adding a bit of kimchi to the sandwich, which I recommend. The Plate came with a heaping mound of pork, greens, and white beans. The beans and greens were fine. They were cooked well and tasted like greens and beans. I would have liked a little more to them, but as simple sides, they were fine. Of course, the pile of pork was insane. This time the cracklings didn’t bother me. Its funny how I can enjoy them when I can prepare myself to bite down on a rock. I’m not a big fan of the sandwich acting simply as a way to hold a bunch of meat. I want veggies or sauce or some other layer that makes the thing a sandwich. This pork is delicious, and I think it could make a ridiculous sandwich (I’m thinking about that Torrisi turkey sandwich), but as Porchetta stands it is just pork on bread. If I ever go back, I will order a sandwich, dump the meat off, and eat it as a pile of pork with the bread on the side. I might try the potatoes or another side dish, but I’m a bit wary after the beans and greens. Honestly, though, I don’t think I’ll go back. If I want heap of pork, I’ll go get some barbecue, and if I want a crazy expensive Italian sandwich and sides I’ll go to Torrisi. If you’re looking for Queso Fundido: Go to La Superior. Actually, I recommend you go to La Superior immediately for that delicious bowl of melted cheese. If you want cocktails: Go to Mesa Coyoacan. They know how to make a damn good Margarita to accompany their delicious food. To give Calexico the benefit of the doubt, I didn’t try a Margarita, but I did try two of their other cocktails. One was a cilantro-infused gin base, that I think might have been worth it if they hadn’t finished it off by drowning it in grapefruit soda, and the other a Mezcal base with avocado. I thought it sounded intriguing , it was awful. I ended up just ordering a Modelo and a shot for $5 bucks, a lonely highlight. If you want tacos: Go anywhere else, La Superior, Mesa Coyoacan, Papacitos, Elote, El Tecolote, or even Union Pool (hell, their tacos are actually pretty damn tough to beat). The carne asada was alright, but I didn’t dig the taco as a whole, which gave it a rather low taco for your money ratio. If you want Barbeque, yes, Barbeque: Go to Fette Sau. I was stoked to see Tortas on the Calexico menu, a Mexican sandwich that I don’t think gets enough love. So I ordered the pulled pork torta, honestly thinking it would be carnitas or at least have some Mexican flavor, it tasted like Barbeque sauce. If you want French Fries, yes, French Fries: Go to a burger joint. French Fries don’t belong on Mexican menu, even if they are the only thing on the menu where you can taste Mexican spices. If you want atmosphere: Go to Mesa Coyoacan or El Tecolote for a more upscale feel. Go to Papacitos or Elote for more fun and relaxed ambiance. Anywhere you go you can get the same or better atmosphere with better food. If you want a $5 beer and a shot: Go to Union Pool. Ok, I’ll give Calexico credit here, that is a great deal, plus they have a ton of Sixpoints on tap; but I would still recommend Union Pool. I mean if you look for a cheap buzz you probably want cheap, delicious tacos too. If you want California style Mexican food: Get on the L train and go to Dos Toros in Union Square, it’s a hole-in-the-wall that does California Mexican food correctly. All in all you can probably tell I didn’t enjoy my visit. This is a little disconcerting because the cart and their other brick and mortar have gotten such rave reviews. I can only go off my experience, and my experience has me wondering about the restaurants that will be moving into Williamsburg, but that’s a whole other post. Full Disclosure: I went at 9pm on 2/9/11. It was crowded but the two of us didn’t have to wait more than a couple minutes for spots to open at the bar. We ordered the three drinks mentioned above, the Queso Fundido, a Carne Asada Taco, and a Pulled Pork Torta.